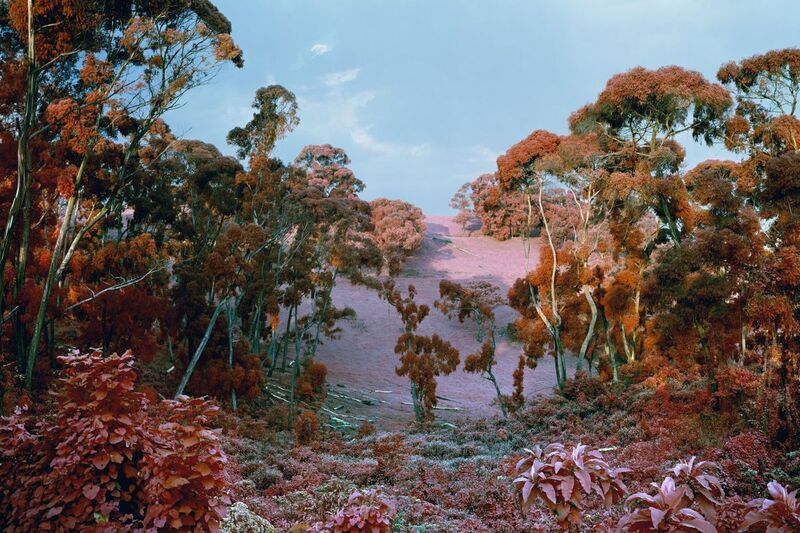 Looking at Richard Mosse's powerful, often enormous, and generally empathetic photographs of refugee encampments in Lebanon and northern Italy, perilous rescues at sea, and guerrilla warfare in eastern Congo, you can see why he borrowed the Bob Dylan song title "Beyond Here Lies Nothin' " for his exhibition at Arcadia University. Mosse, an Irish photographer based in New York, notes that the song's haunting lyrics are said to have come from Ovid's poems about exile and relate to his own themes of human displacement. "Plus," Mosse says, "the song is about love, and how we really have nothing if we lack love, and so there is nothing beyond love. It's an important message in times of hate, wall building, and cultural war." The five large digital prints from "Infra," a series he began in 2010 and completed in 2015, are the most visually arresting of his works, not least because they depict close-up shots of Congolese rebels and soldiers and lush tropical Congo landscapes as photographed with a large-format camera loaded with Kodak Aerochrome, an infrared film originally intended for aerial vegetation surveys to identify camouflaged targets and later used in the 1960s for album covers (Jimi Hendrix, the Grateful Dead, Frank Zappa, others). Mosse's use of the film displays Congo's dense foliage in vivid reds and pinks, leaving human skin tones and some clothing untouched. This makes the human figures in his photographs look like cutouts collaged into landscapes. This is war photography turned inside-out — repurposing military scouting technology as fine art in conceptual art territory. Two monumental panoramic works from his ongoing series "Heat Maps" seem to be showing straight-on views of refugee encampments — one in Liguria, Italy, the other in Lebanon — but turn out to be composites of hundreds of individual frames. Both works were made with a video camera that registers thermal radiation (as opposed to visible light) attached to a robotic motion-control tripod that allowed Mosse to scan sites from a high eye level. Blurry and dreamlike, the small framed photographs from the series "Incoming" (2014-17) are stills from a video installation of the same name, which accounts for their narrative character. As with the works of Mosse's other series, one is left to guess at the situations or events he is presenting. Are those refugees being pulled from the sea, for instance, or locals in distress? You also have to wonder how Mosse found himself there at that precise moment. In fact, much of the video in "Incoming" was shot from a U.S. aircraft carrier with a surveillance camera that sees beyond 30 miles. It's rare when pyrotechnics allow for quiet contemplation, but Mosse has found the balance, with great heart. Through April 15 at Arcadia University Art Gallery, 450 S. Easton Road, Glenside. Hours are 10 a.m. to 5 p.m. Tuesdays, Wednesdays, and Fridays; 10 a.m. to 7 p.m. Thursdays; and noon to 4 p.m Saturdays and Sundays. Information: 215-572-2131 or gallery.arcadia.edu. The show is affiliated with "Global 1968" a series of talks organized by Arcadia's Historical and Political Studies Department. Mosse will speak there Feb. 28. “The Follow” (2011) by Anthony Goicolea, at Swarthmore College’s List Gallery. I thought Anthony Goicolea was strictly a photographer, remembering digitally manipulated self-portraits from the 1990s that portrayed him as various adolescent boys in awkward scenes. I was wrong, though. He draws and paints, too. "Figure/Ground," his soon-to-close show of photographs, paintings, and drawings at Swarthmore College's List Gallery, displays his ability to move fluidly through these media. The show, with works made between 2007 and 2013, also makes it clear that Goicolea is more interested in telling stories than sticking safely to any one medium. His Cuban-born parents and other family members occupy his paintings and drawings, and some photographs as well. But the stars in this show are his large color photographs exploring human interventions in landscapes — and not in a preachy way. They're invitingly strange. Ruins in the Forest shows a permanent-looking campsite in a jungle, The Follow a deserted mansion in what might be Florida or Cuba, Tunnel an eerie rain-soaked view of a soon-to-be flooded tunnel. Through Feb. 22, List Gallery, Swarthmore College, 500 College Ave., Swarthmore, noon to 5 p.m Tuesdays through Sundays. Information: 610-328-7811 or swarthmore.edu/list-gallery. “Milk Drop Coronet” (1957) by Harold Eugene Edgerton, at Haverford College’s Atrium Gallery. Haverford College's terrific collection of photographs extends across the history of the medium. That includes, of course, the history of color photography, which began with Eastman Kodak's Kodachrome transparency film in America in 1935 and Agfa Gevaert's Color-Neu transparency film in Germany in 1936. "A Survey of Color Photography from Its Prehistory to the Present Day," organized by Haverford professor and photographer William Earle Williams, shows off 75 color prints by Richard Avedon, Harold Eugene Edgerton, William Eggleston, Walker Evans, Nan Goldin, David Graham, Helen Levitt, Duane Michals, Richard Misrach, Thomas Porett, Stuart Rome, Cindy Sherman, Stephen Shore, Sarah Stolfa, Zoe Strauss, Joel Sternfeld, and others. Through April 29, Atrium Gallery, Marshall Fine Arts Center, Haverford College, 370 Lancaster Ave., Haverford, 10 a.m. to 5 p.m. Mondays through Fridays; noon to 5 p.m. Saturdays and Sundays. Information: 610-896-1267 or haverford.edu/fine-arts/exhibitions.